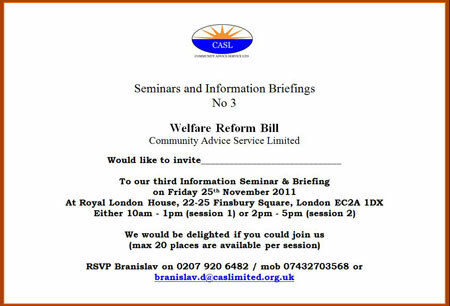 Friday, 25th November 2011 saw the latest of the seminars run by CASL at its office in Finsbury Square. It brought together a variety of housing providers to listen to our guest speakers, Cathy Payne talked about the proposed changes to welfare benefits under the Welfare Reform Bill 2011 and Alison Gelder spoke on proposing alternatives and finding partners in the light of the latest Welfare Reform Bill. Cathy, Deputy Head of Housing Policy at the Department for Work and Pensions gave an in depth resume of the welfare reform measures as they are likely to affect housing providers, their tenants and shared-owners. This was followed by a lengthy Q&A session stimulating a wide debate about the changes, in particular the potential impact on housing providers incomes, whether there were any provisions for direct payment of rent/mortgage and how this might be achieved particularly where benefit recipients were already in arrears. Other apparent flaws were also aired and explored and direct representation by housing providers to DWP was encouraged. The inclusion of a resident at the proceedings to give the tenants perspective was welcomed and proved very stimulating. The remarkable young man (tenant) made some very weighty points to Cathy and obliged a wider perspective including youth employment, hope and prospects for their future. Stuart Freeman of CASL gave a talk focussing on the very large problems perceived to be inherent in the changes and the need for housing providers to be prepared for the difficulties. To a great extent these could be assisted by providers embracing proactive debt and welfare counselling and representation such as that provided by CASL and also the provision of education such as the Financial Capability courses offered by CASL and the Resident Ambassador initiative. Alison Gelder, Director of Housing Justice, made everyone aware that the Bill was not yet on the statute book and could still be defeated or significantly amended if the will existed and representations were made. Representing the broadest spread of Christian churches she offered amongst other things, interesting and imaginative insights into how assistance and education could be given at a very localised and immediate level through this structure of churches. The gathering rounded off with further Q&A's extending into an informal session with refreshments and sandwiches.